Midwifery care and home birth are proven to be just as safe and in some cases safer than hospital birth. The personalized, one on one care that midwives offer is crucial to recognizing complications and high risk scenarios. Midwifery care is only provided to women with low risk pregnancies. Please call or email if you have any questions on whether you are low risk. Please feel free to give us a call with any questions that you may have. Regardless of where you decide to give birth, we love to answer questions and educate families. Midwives take the place of an OB and will maintain the same schedule of prenatal visits throughout your pregnancy. Your midwife will do all of your blood work in the office and will send you to an ultrasound clinic for necessary ultrasounds. Each of your prenatal visits are 45 minutes to 1 hour in length so that all of your questions are thoroughly answered, your emotional concerns are addressed and your pregnancy is on track. It is our responsibility to ensure that mom and baby are healthy as a whole. We want to provide you with a compassionate, safe home birth. Your midwife will be on-call for you throughout your pregnancy but especially during and around your due date. Once active labor is assumed, your midwife will come to your house to assess and monitor you and your baby. All vitals are taken and baby is assessed, if you are in active labor your midwife will stay with you until your baby arrives. You will be encouraged to eat and drink throughout labor to keep up your energy. A variety of different techniques may be suggested such as resting, walking, sitting on the birth ball, getting into the shower, getting into the birth tub, etc. Your midwife will set up the birth tub when she arrives and will fill it with warm water when you are ready. A birth assistant will be called at some point during your labor as it is important for your midwife to have an extra set of hands. No routine IV’s, urine catheters or continuous fetal monitoring is performed. *These are items your midwife will have on hand only if necessary. Rest assured once the baby is born he/she is never taken out of your sight. The first hour is reserved solely for bonding between the new family and initiation of breastfeeding. After the first hour the newborn exam is done, Vitamin K and erythromycin eye ointment is offered and we finally weigh the baby! Vitals are performed on mom and baby throughout the immediate postpartum period. Your midwife and birth assistant will do most of the cleaning up after the birth and again you will be encouraged to eat and drink in order to aid in your recovery. Your midwife and assistant will stay with you for 2-4 hours after the birth to ensure both mom and baby are stable and healthy. Your midwife is on-call for you during this period as well and will be back to your home for a visit when your baby is 24 hours old, this assessment will include all vitals and breastfeeding check. You will also have a 3 day, (in- home visit) a 2-3 week (in-office) visit and a 6 week (in-office) visit. These visits include assessment of mom and baby ensuring that baby is gaining the correct amount of weight and is not developing jaundice. All clients will be encouraged to see a pediatrician within 72 hours of the birth. Recommendations can be made for more natural pediatric physicians. All Clients are entitled to a payment plan that is broken down based in the individual needs of the client. Coastal Midwifery accepts most insurance plans including Medicaid. In order to verify your insurance benefits and determine the amount of your out of pocket expenses, you must fill out a verification of benefits form through our billing agency and submit a small fee of $25 for this service. 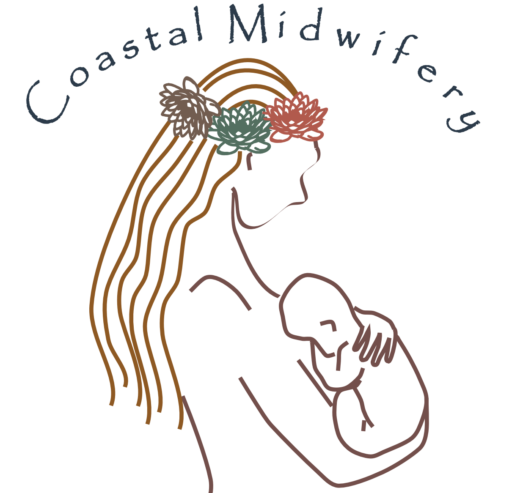 All other fees for the billing agency will be paid for by Coastal Midwifery once you come into care. All insurance clients will need to pay 50% of the full midwifery fee by 36 weeks of pregnancy. Once we receive payment from the insurance company you will be reimbursed this deposit. Medicaid covers most of the expenses but clients will owe $800 out of pocket for things that medicaid does not cover, such as: Birth Assistant, Water Birth Tub (not optional), Postpartum Birth Kit, and a Concierge fee. For more information on which Medicaid plans we currently accept please call us.